I was inspired by deer stands on my drives through Wisconsin, and began having conversations with hunters about the tradition of hunting in their families. Some people described building the stands as something permanent that could be passed to the next generation, especially sons who would inherit the land. I was anticipating the birth of my own son and thinking about my legacy, so this idea resonated strongly with me. I also heard hunters emphasize that their pastime is not about violence, but more about oneness with nature and time spent with their children in the stands. I wanted these photographs to capture the serenity of that sentiment, and to suggest the dignity associated with hunting when seen as a means of feeding one’s family. Finally, I wanted to look at the issue from a historical standpoint, and the impermanent nature of some of the stands illustrates the fading tradition of hunting in Wisconsin. When I was diagnosed with leukemia in 2011, my work on hide was put on hold. I was 32 years old and had a three-month-old baby at home. Having to face mortality so unexpectedly made me come back to the project with a new perspective on the ideas of permanence and impermanence. Ultimately, hide became a reflection on my own legacy and family, an homage to the state that has become my home, and a narrative about accepting change. I find these elevated stands a blight upon the landscape. Moreover, I find it hard to justify their use as "hunting." Rather, it would be better characterized as "shooting." Hunting has changed dramatically over the decades. The most current method is to build an elevated house and sit to wait for a deer to come by. The percentage of elevated stands with a nearby bait pile is high in places where baiting is still legal. There was a time when baiting and use of elevated stands was illegal. Competition for deer with large antlers is great, which makes it into trophy shooting. Gone for the most part where a hunter actual hunted. 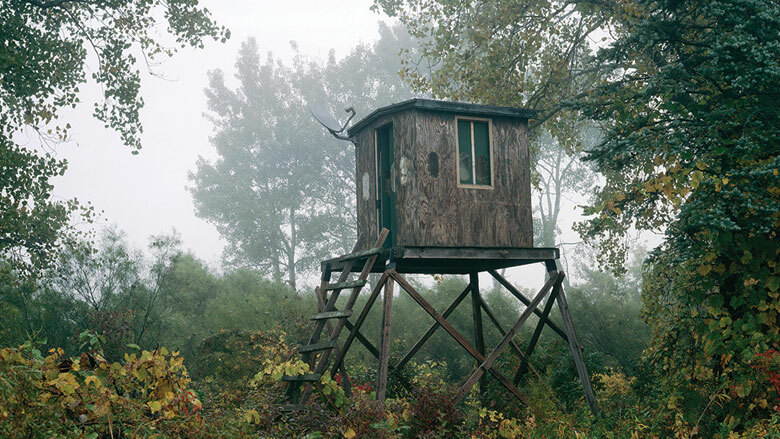 Too many people don't want to get cold and uncomfortable, or heaven forbid, miss a football game that is televised, so some of these stands are really cabins on stilts.